Popular free iOS game "Weed Firm," which reached No. 1 on the App Store charts, was removed by Apple on Wednesday, drawing criticism from the developer due to the continued availability of other applications that feature illegal activity. Manitoba Games issued a statement on its website this week saying that the removal of Weed Firm from the App Store was "entirely Apple's decision." They went on to note that a number of weed-based applications remain available, "as well as games promoting other so-called 'illegal activities' such as shooting people, crashing cars and throwing birds at buildings." The developer has pledged to edit the game and bring it back to the App Store in a new, censored form. Manitoba Games touted the openness of Google's Android platform, and said Weed Firm will remain "as censorship free as possible" on non-iOS devices. "We do not want kids playing Weed Firm, but we firmly believe that adults should have a choice to do whatever the hell they want as long as they are not hurting anybody in the process," the developer said. 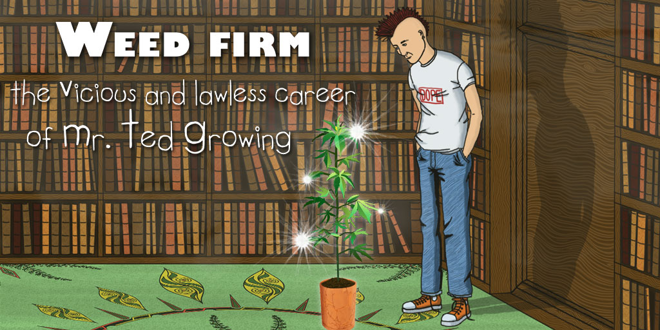 In the game, "Weed Firm" players could grow and sell their own marijuana, all while interacting with gangsters and criminals in an effort to maximize profits. Its removal was first noted on Wednesday by Cnet. Apple's App Store review process has always been something of a mystery and point of frustration for some developers. The company requires that all applications be reviewed and approved before they are made available to download, ensuring quality control and also restricting the availability of objectionable content. But inappropriate applications do occasionally slip through the cracks and must be pulled after they have been made available. It's unknown exactly why Apple opted to pull "Weed Firm," however, given that it was approved for the App Store and comparable applications continue to remain available. For example, as of Wednesday afternoon, the App Store still offers "Weed Farmer," "Weed Tycoon," and "iRoll Up Friends," three marijuana-related games that feature similar subject matter. Apple first began to pull back the curtain on its review process in 2010 when it published its App Store Review Guidelines. Those have been continuously updated ever since, in an effort to explain to developers what kinds of content are considered unacceptable on the App Store. Last October, Apple announced that there were more than 1 million apps available on the iOS App Store for iPhone and iPad. At that time, users had downloaded more than 60 billion applications in the App Store's history.